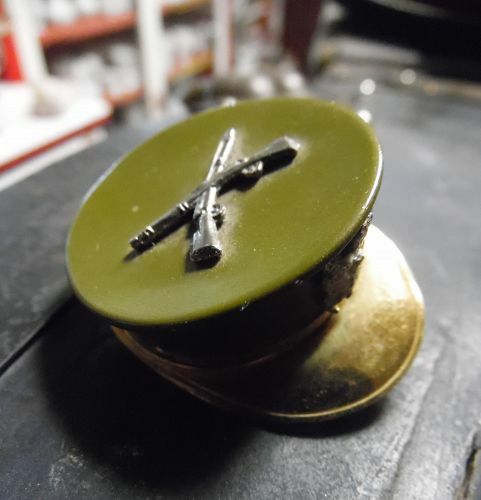 Vintage WW1 Army Sweetheart Mourning Keepsake Locket Hat Shaped PIN BROOCH Metal pin in the shapee of a hat with military artillery insignia. Once held a picture of a military loved in the compartment underneath locket fashion. Pin measures 1-1/2' long X1-1/2"wide X 3/4" deep. Condition is wonderful. There is no paint loss or scratches.The hinge is nice and tight. 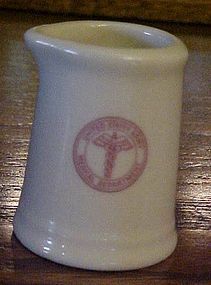 Vintage Royal China Inc Sebring Ohio, United States Army Medical Dept logo individual creamer. 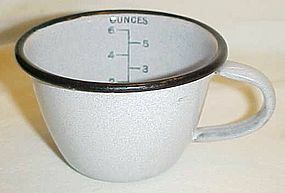 Creamer measures 2 5/8" tall. Excellent condition showing no wear. There are no chips, cracks or breaks. The logo is on the bottom. Made of nice heavy restaurant ware weight. I have just one availiable, but have several other brands of Army medical china from different manufacturers that match. 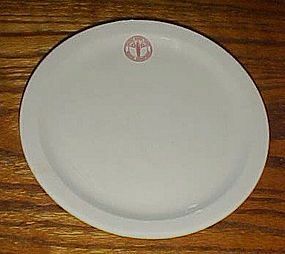 Vintage Royal China Inc Sebring Ohio, United States Army Medical Dept logo dessert plate. Plate measures 7 1/4" across. Gently used condition showing some very light wear if any. There are no chips, cracks or breaks. 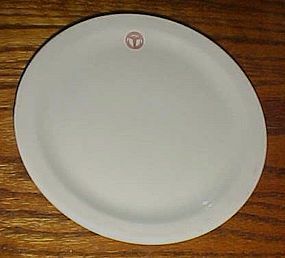 The round logo is on the bottom of the plates. They are a nice heavy restaurant ware weight. I have 10 availiable, price is per plate, but have several other brands of Army medical china from different manufacturers. 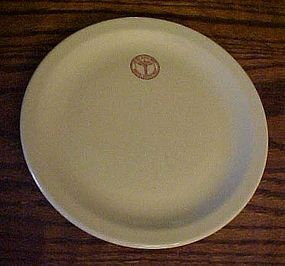 TEPCO Army medical logo bread and butter plate 6 1/2"
Vintage TEPCO United States Army Medical Dept logo bread & butter plate. Plate measures 6 1/2" across. Gently used condition showing some very light wear if any. There are no chips, cracks or breaks. The TEPCO logo is on the bottom of the plates. They are a nice heavy restaurant ware weight. I have 5 availiable, price is per plate, but have several other brands of Army medical china from different manufacturers. 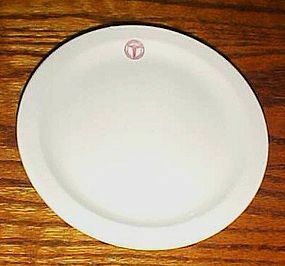 Shenango China Army Medical bread plate 6 3/8"
Vintage Shenango United States Army Medical Dept logo bread & butter plate. Plate measures 6 3/8" across. Gently used condition showing some very light wear if any. There are no chips, cracks or breaks. The Shenango logo is on the bottom of the plates. They are a nice heavy restaurant ware weight. I have 3 availiable, price is per plate, but have several other brands of Army medical china from different manufacturers. Shenango China Army Medical red logo plate 7 1/4"
Vintage Shenango United States Army Medical Dept salad or dessert plate. Plate measures 7 1/4" across. Gently used condition showing some very light wear. There are no chips, cracks or breaks. 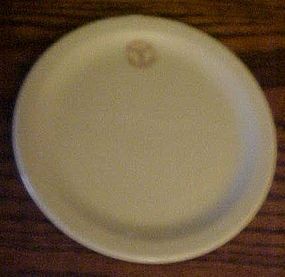 The Shenango logo is on the bottom of the plate. They are a nice heavy restaurant ware weight. I have just one, but have several other brands of Army medical china from different manufacturers. Mayer China Army Medical logo plate 7 1/4"
Vintage 7 1/4" Plate UNITED STATES ARMY Medical Department Mayer China Est 1881 backstamp. Made of restaurant weight Porcelain. Condition is Very good, with very light scratches. I have other similar Army medical logo pieces but made by different companies and logo size may vary from brand to brand. I just have 1 like this. 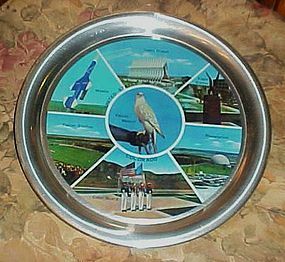 Here is a very nice item in a vintage aluminum metal souvenir tray. 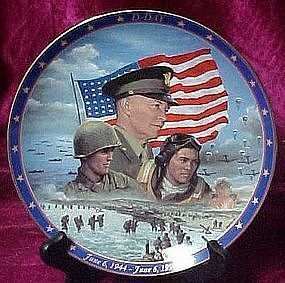 This one is decorated with scenes from the United States Air Force Academy. The color guard, Falcon stadium, Cadet Chapel,Eagle Stadium, the planetarium and other scenes. It is in excellent used condition. No scratches or dents. 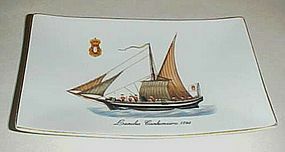 Measures 11". Light name scratched in the back. Lucky you, if you have the mate to this little sailor shaker. Kewpie doll face and big bell bottom trousers. Measures just under 3" tall. Hand painted detailing. Red Japan stamp. No cork. 5 shaker holes in his hat. No chips or damages. The second issue in the World War II: A Remembrance Collection by Jim Griffin. 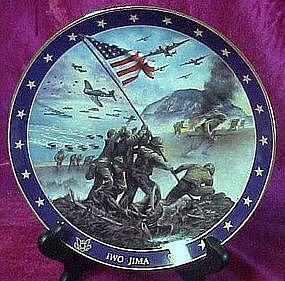 This plate portrays The Battle of Midway, Victory in the Pacific. Limited edition by the Bradford Exchange. 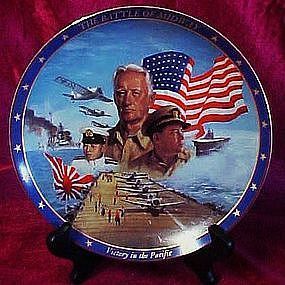 8" diameter – Excellent Condition and includes styro box and Certificate of Authenticity). 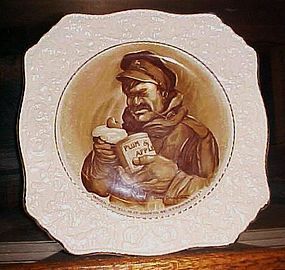 First issued plate in the Visions of Glory series by artist David Cook and the Bradford Exchange. Measures8" in diameter and has lots of lavish gold trim that highlights this great plate. Pristine, never displayed condition. Comes with certificate of authenticity and original styro box. I have 2 avaiable. I will be listing others in this series. THis is a wonderful collectible knife. WWII fixed blade theatre fighting knife. Excellent condition and comes with a fancy leather sheath that has always ben with it. Measures 7 1/2" long and is marked Boulder Colo. Patd Made in USA. I believe this is made by Western. An awesome price for this great collectible knife. 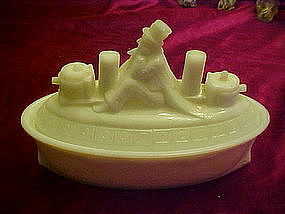 Made by Flaccus, this milk glass candy container was made in 1898 civil war era. Uncle Sam sits atop the Merrimac. Measures almost 5" tall and is 6 3/4" long. Very nice condition. A couple of micro chips on the edge and his hat that maybe just a roughness on the mold edge. a small hairline crack that I just noticed about 1" long on the lid (very hard to detect). You will be very impressed with the condition of this old piece of history! Please ask if you would like to see more photos.